On July 16, the Franconia Conference Board appointed Angela Moyer as interim assistant moderator. This position is interim pending affirmation by the Conference delegates at the November 2-3 assembly. With this new role Angela will sit on the Conference Board Executive Committee as vice-chair and be vice-chair of the Conference Board. 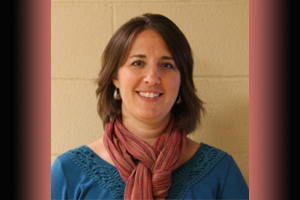 Angela grew up in Franconia Conference and served as youth pastor at Rockhill Mennonite Church from 2005 to 2011. During that time, she sensed God calling her deeper into ministry and enrolled at Eastern Mennonite Seminary (EMS), Lancaster, PA to pursue her Master of Divinity which she acquired in 2012. Angela then went on to serve at Ripple in Allentown where she is currently one of five co-pastors. Throughout her career she has been bi-vocational, working as pastor and also as an occupational therapist. Currently, while serving the Ripple community she also works in Early Intervention at Good Shepherd Rehabilitation. Conference moderator John Goshow noted Angela’s involvement and outstanding service as a member of the Conference board since 2015 and on the executive minister search committee in 2016. “Angela is deeply rooted in our Conference community with broad relationships in our urban and historic congregations. She knows our story, our ministries and our global partners. She’s a measured and thoughtful next generation leader who will bring wisdom, insight and hope to our work and witness together,” said Executive Minister, Steve Kriss. With her roots in Telford and as an urban and bi-vocational pastor, her gifts and background are well-suited for this new role on the board. For more about Angela, check out the article that welcomed her to the board in 2015.